Wayne W. Parrish, Washington; gift 1972 to the Corcoran Gallery of Art, Washington; acquired 2015 by the National Gallery of Art. When Parrish offered the sculpture to the Corcoran, he wrote: "Some years ago I acquired one of Peter Voulkos' early ceramic pieces on the west coast." Letter of 5 September 1972, to Gene Baro, director of the Corcoran, in NGA curatorial files. 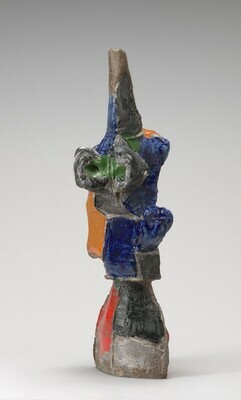 Peter Voulkos, San Francisco Museum of Art; Museum of Contemporary Art, Houston; Museum of Contemporary Craft, New York; Milwaukee Art Center, 1978-1979. 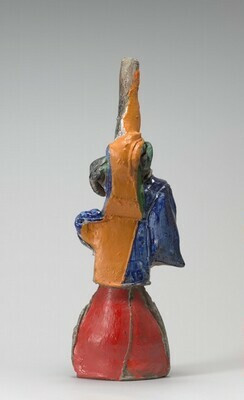 Ceramic Sculpture: Six Artists, Whitney Museum of American Art, New York; San Francisco Museum of Modern Art, 1982. 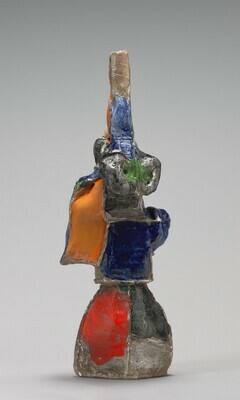 Modern and Contemporary Art from the Collection, Corcoran Gallery of Art, Washington, D.C., 2006-2007. Looking for the "There There": California Art from the Collection 1950-2000, Corcoran Gallery of Art, Washington, D.C., 2007-2008. Slivka, Rose. "The Dynamics of Destruction." Art in America (January 1999): 87, unnumbered figure. Prescott, Theodore L., ed. A Broken Beauty. Grand Rapids and Cambridge, England, 2005: 64 fig. 6.